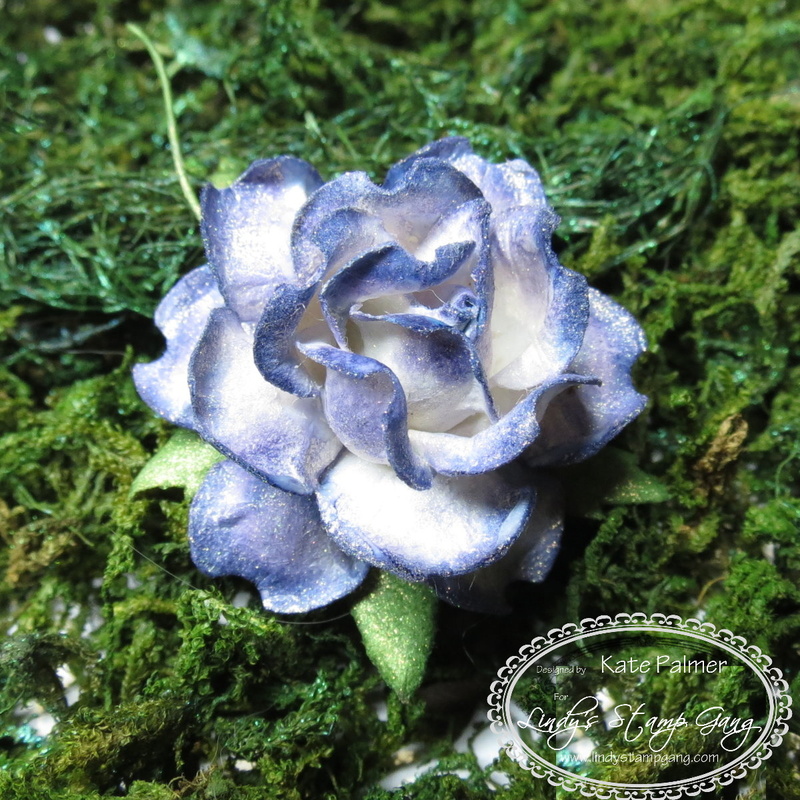 Today I thought I’d show you a neat little technique for coloring your own paper flowers and a little sparkle is the final step needed to take these from simply gorgeous to super stunning. Begin with a white or light coloured paper flowers (I like roses and gardenias because they are easy to colour). Choose 3 or 4 colours of Copic marker (for the shabby chic look I chose a dark and a light brown and 2 reds (mid tone and dark). I colour up a few different sizes at once so that I have a small coordinating bouquet ready. Colour 1/2 of each petal with your lightest colour of Copic marker (mine was E31) working from the outer edge in towards the flower centre – make sure not to colour the whole petal. Next using the darkest brown (E35) apply a thin strip of colour to the outer edge of each petal – I just run the side of my marker along the edge of the petals. Then with the lightest red R35, apply a thin strip of colour to the outer edge of the petal BUT don’t cover up all of the dark brown – add colour quite sparingly. Again I just scrape the side of my marker along the edge of the petals. It should look a little like this. Lastly with the darkest red R39, apply a thin strip of colour to the outer edge of the very top petals only – leave the petals closest to the leaves without this colour. The next step is to apply a few drops of Colorless Blender to each petal – add the liquid to the outer edge of the petals – the fluid will wick towards the flower centre and drag a little colour along with it. 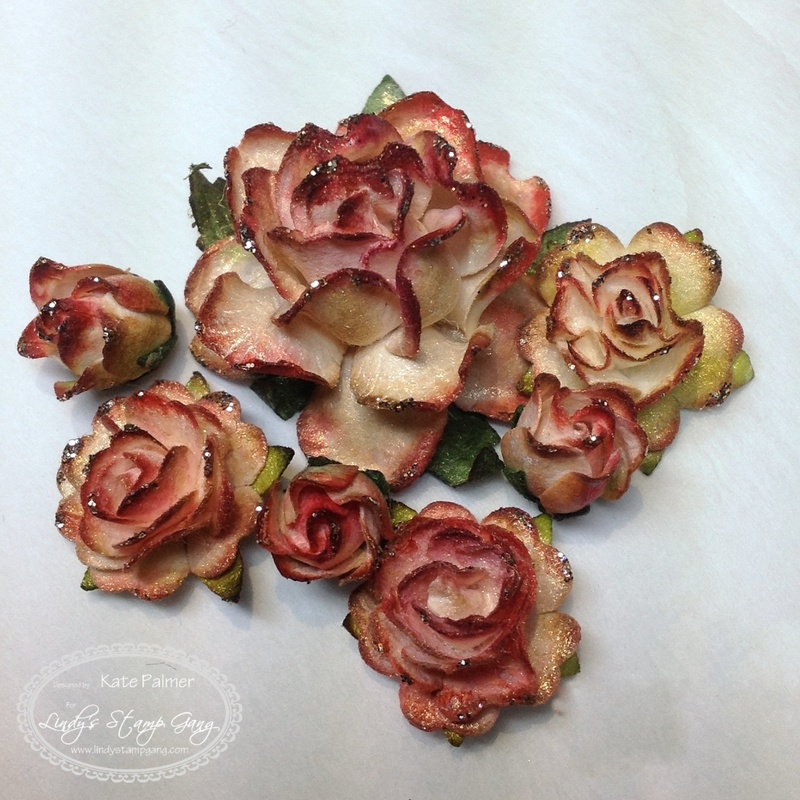 Dry the flower with a heat gun / embossing gun – this will take up to 45 seconds depending on how wet the flower is. Drying with the heat gun will not only evaporate the blending fluid, but it also results in discolored edges to the petals (they darken considerably) giving a more beautiful result! Soak (and I mean REALLY SOAK IT!) each flower with a pale or colorless Lindy’s Stamp Gang spray – my favourite is Creme Brulee Cream Starburst or any of the Glitz Spritzes. Dry the spray with a heat gun or embossing gun. It should now look a bit like this, isn’t it stunning. The final step is to add Stickles or glitter of your choice to the petal edges. And to give you a few extra ideas, this is the same technique, but for this flower I used only 2 Copic colours – both purples. 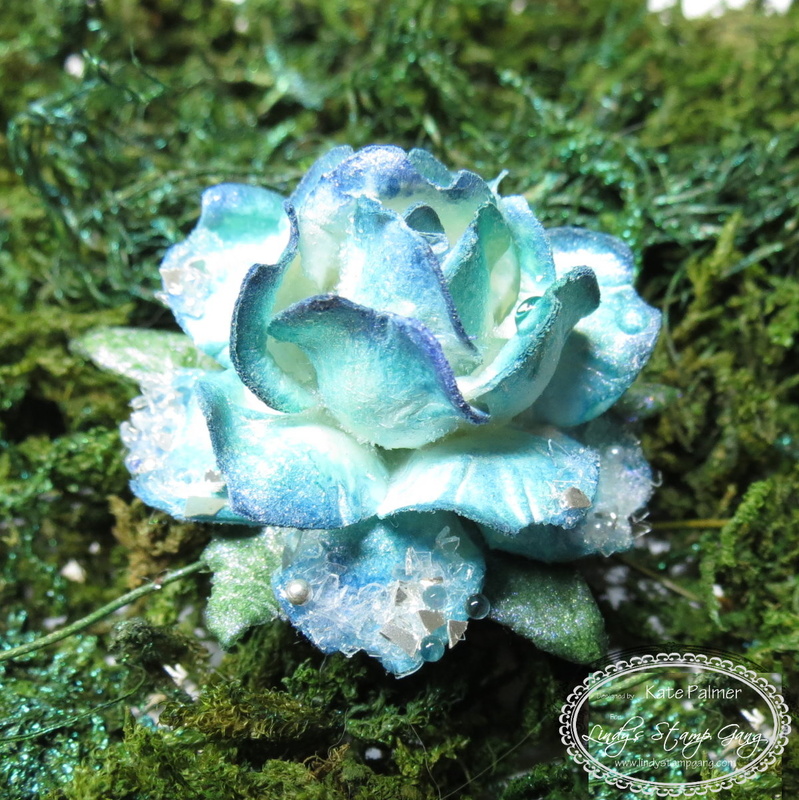 and finally for this flower I used Glitz Spritz instead of the Creme Brulee Cream Starburst. For all those who prefer to watch how this was done, there will be a video for this process on the Lindy’s Stamp Gang You Tube channel today. I hope you’ve enjoyed this idea – and can use this in your creative projects and don’t limit yourself to the colors I used, you can try this with so many different things – the new Glitz Spritz colors would look amazing. Thanks Doris – I think they’re pretty great too! Wow what a transformation – they look gorgeous!! Wowwww, It looks super! I never wanted to buy the copics, because there is SO MUCH to buy, but now I have to. What did you do to me?? Thanks for sharing!